The Lectures which compose this volume were written, chiefly as a relaxation from professional work, and delivered to the inhabitants of Aberdour more than twenty years ago. Designed for popular audiences, they are written in a simple, spoken style. They do not offer to the confirmed antiquary the minute details and constant reference to authorities which his habit of mind demands ; and to very grave people the little pleasantries which occur may appear trifling. But such readers will be good enough to bear in mind the audiences to whom the Lectures were originally adapted, and they may find that what lightened the task of listening to historical details has also made the reading of them more easy. 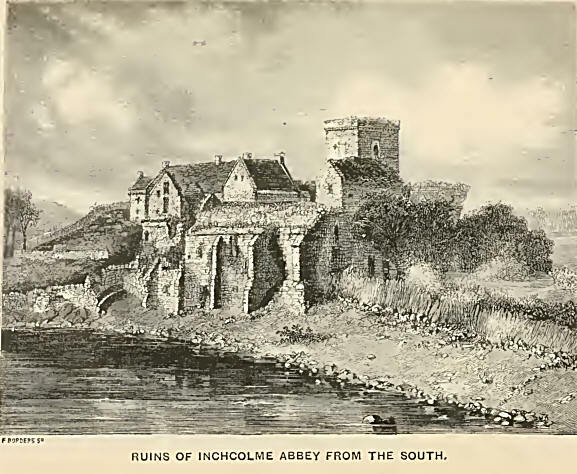 As regards the subjects with which the volume deals, it may be said, first of all, that this is the only attempt to give anything like a full account of the Monastery of Inchcolme, drawn mainly from its charters. To those who live in the neighbourhood of the ruins of the Abbey, whether on the Fife coast or the Midlothian shore of the Firth, the want of information regarding the old Religious House must often have been felt. But great difficulties have lain in the way of providing this. The original Chartulary of the Abbey seems to be irrecoverably lost ; and few can be expected to wade through the Macfarlane transcript of it in the Advocates Library. The author had a copy of this MS. made, and through the kindness of the Hon. John Stuart, afterwards Earl of Moray, he got admission to the charter-room at Donibristle, which brought other valuable papers connected with the Monastery under his notice. He has also been at pains to consult every authority within his reach that was thought likely to give information on the subject. The most of these authorities, if not all, are named in the body of the Lectures, and it will be a matter of regret if any of them are omitted. To the author it seems most desirable that the information contained in the printed Chartularies, and even those still in manuscript, should be brought within the reach of the ordinary reading public. He has attempted to do this in the case of the MS. Chartulary of Inchcolme, but could wish that he had been more successful. He has endeavoured to reproduce the living past, in its broader and more important lines of thought and action, and has not forgotten that mere lumber, however ancient, is lumber still. As regards the historical notices connected with Aberdour, the author can only hope that his old friends, the inhabitants of the village and parish, will derive some pleasure from the reading of this volume, and that his researches will do something to call attention to a beautiful and interesting health resort, in which many of his happiest years were spent. It may seem strange to some, that, in spite of many requests to give these Lectures to the public, so many years should have been allowed to elapse between their delivery and their publication. But occupied as the writer has been with busy pastoral work, in a health resort still more frequented than Aberdour, it has only been of late, when failing health has made an assistant necessary, that he has found leisure to prepare this volume for the press. This delay has, however, enabled him to add a number of facts, which make his account of the Monastery and the parish still more complete. The author has only further to add that, amidst such a multiplicity of statements, stretching over so many years, it will not be thought wonderful if, in spite of all his care, some errors have crept into his book, and some important facts have been left unnoticed. And as regards the moralisings which are found in the Lectures, it has been his aim in all he has written, not only to exhibit the great natural beauty and the rich historical interest of the neighbourhood with which he has been dealing, but also to advance the cause of morality and religion. Bridge of Allan, May 1885.